How can I mpose the following condition: the field which is a matricule must comprise only the letters A, B or C with a combination of numbers 0 to 9? 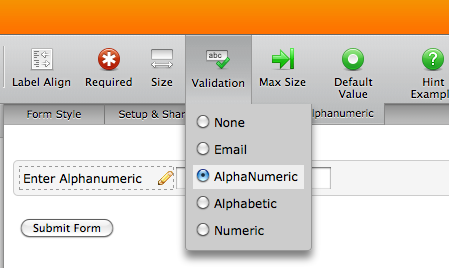 Select the question on the form builder, click on "Validation" on the toolbar and check "Alphanumeric" option. 2. Click on "Share Form"
3. Click on "Advanced Options"
4. Click on "Full Source Code".